Knowledge is born in a three-stage process of reflection on experience - here's how. 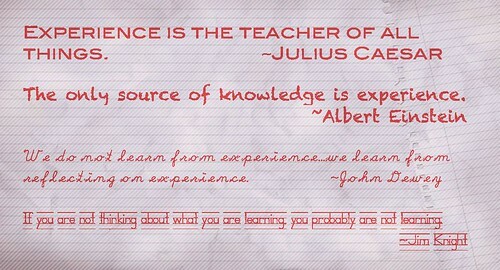 I think most people accept that knowledge is born through reflection on experience. The three-stage process in which this happens is the core of how the military approach learning from experience, for example as documented in this presentation from the Australian Army (slide 12). The three stages are the identification of Observations, Insights and Lessons, collectively referred to as OILs. Here are the stages, using some of the Australian Army explanation, and some of my own. Observations. Observations are what we capture from sources, whether they be people or things or events. Observations are "What actually happened" and are usually compared to "What was supposed to happen". Observations are the basic building blocks for knowledge but they often offer very limited or biased perspective on their own. However storing observations is at least one step better that storing what was planned to happen (see here). For observations to be a valid first step they need to be the truth, the whole truth (which usually comes from multiple perspectives) and nothing but the truth (which usually requires some degree of validation against other observations and against hard data). Insights. Insights are conclusions drawn from patterns we find looking at groups of observations. They identify WHY things happened the way they did, and insights come from identifying root causes. You may need to ask the 5 whys in order to get to the root cause. Insights are a really good step towards knowledge due to their objectivity. The Australian Army suggests that for the standard soldier, insights are as good as lessons. Lessons. These are the inferences from insights, and the recommendations for the future. Lessons are knowledge which has been formulated as advice for others, and the creation of lessons from insights requires analysis and generalisation to make the insights specific and actionable . The Australian army defines lessons as "insights that have specific authorised actions attached.... directed to Army authorities to implement the stated action", and there is a close link between defining an actionable lesson, and assigning an action to that lesson. This progression, from Observation to Insight to Lesson represents the methodology of learning by reflection. The Retrospect meeting and the (smaller scale) After Action Review both provide a structured discussion format which moves increments of knowledge through the three stages.. In other organisations these three stages are separated. Observations are collected, analysts use these to derive insights, and then an authoritative body adds the action and turns the insights into lessons. My personal preference is to address all three steps as close as possible to the action which is being reviewed, using the same team who conducted the action to take Observations through to Lessons. But however you divide the process, and whoever conducts the steps, these three stages of Observation, Insight and Lesson are fundamental to the process of learning from experience.